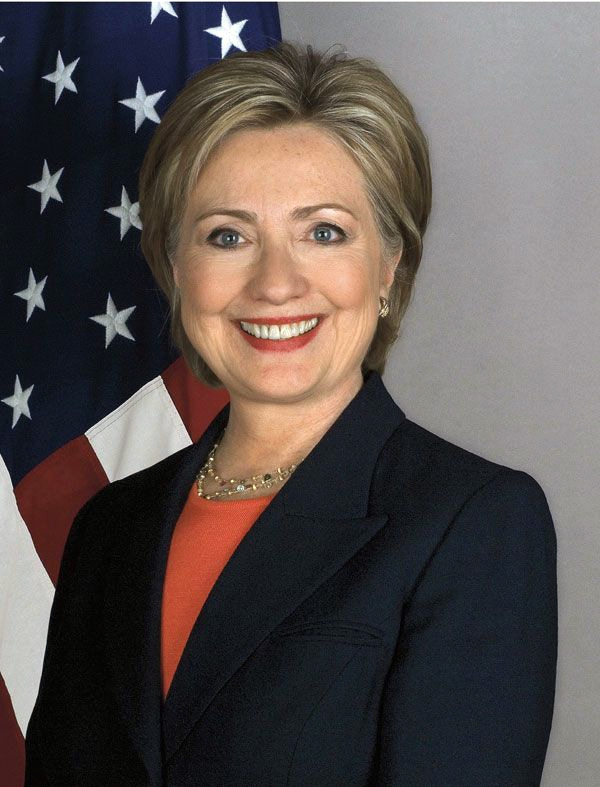 Hillary Clinton is a former First Lady of the United States, U.S. Senator, and U.S. Secretary of State. She is the wife of former U.S. President Bill Clinton and has run for President twice, losing in the Democratic primaries in 2008 and in the Electoral College in 2016. Clinton has been implicated in numerous scandals and controversies throughout her career, including Travelgate, Whitewater, Benghazi, improper use of private email servers, and Clinton Foundation conflicts of interest. Clinton’s 2016 presidential campaign—which was criticized for arrogance, relying on faulty assumptions, and an inability to connect with voters — was described by Newsweek as America’s “biggest — and most important” political failure. Following law school, Hillary worked for the House Judiciary Committee during the Watergate hearings. In 1975, Hillary married her former Yale classmate Bill Clinton in Arkansas. In 1976, Bill was elected Attorney General of Arkansas. One year later, Hillary joined the prestigious Rose Law Firm as an associate specializing in intellectual-property law and patent infringements. Hillary’s personal political staff became known as “Hillaryland,” reportedly more loyal to Hillary than to the President. Clinton White House insiders have described Hillary as the driving force behind the scenes steering her husband’s political agenda. Her political efforts have also been criticized as messy and politically clumsy. After nine months of brainstorming and politicking, the Clintons delivered a 1,342-page proposal for universal government-controlled health insurance, with Hillary indicating that her overarching goal was to guarantee health benefits for all Americans by forcing employers to provide health insurance to all their employees. The plan would give every American a “health care security card” that would “irrevocably entitle” him or her to medical treatment. Hillary then led the led the charge to pass the legislation and testified in a series of lengthy congressional hearings. Among the criticisms were that Clinton’s task force’s policy development, which was plagued by secrecy, “planted the seeds of trouble” for the proposal and that Clinton “alienated potential allies in Congress” by seeking out and then ignoring their input. The plan itself was criticized as an overly complex expansion of federal authority. Ultimately, Hillary’s government-run healthcare push, dubbed “Hillarycare,” failed in September 1994. The ensuing 1994 Congressional elections were said to have been a referendum on Hillarycare and led to the Republicans taking control of both houses of Congress for the first time in four decades. At the beginning of the Clinton administration, “seven people lost their jobs in the office that handles travel arrangements for presidential trips in 1993” and were replaced with “Clinton associates from Arkansas.”  Independent Counsel Kenneth W. Starr “found substantial evidence that Hillary Clinton was involved in several of the controversial firings.” White House officials subsequently acknowledged that they had acted rashly, and rehired some of the employees.”  No action was taken against Hillary Clinton. Ultimately, the Whitewater development deal failed, as did a savings-and-loan corporation owned by Jim McDougal, in 1989. The S&L failure cost taxpayers an estimated $60 million. The Clintons lost an estimated $67,000 on their Whitewater investment, but McDougal helped pay off Bill Clinton’s campaign debts, and Hillary Clinton’s law firm received unknown sums in fees for representing McDougal’s savings and loan. In 1993, Deputy White House Counsel Vince Foster, an old Arkansas friend and co-worker of the Clintons, was found dead from a gunshot wound in Virginia’s Fort Marcy Park, a month after he filed three years of delinquent Whitewater corporate tax returns. Several investigations by law enforcement, bipartisan members of Congress, and Independent Counsel Starr concluded that Foster committed suicide. In the aftermath of Foster’s death, White House staff removed documents related to Whitewater from his office at Hillary’s behest and changed their story multiple times under questioning. The Whitewater financial dealings prompted multiple investigations to determine if money was improperly funneled to Bill’s 1984 gubernatorial campaign. During these investigations, federal and Congressional investigators subpoenaed Hillary’s billing records unsuccessfully for over two years. The records, which disappeared from her former law firm, were found at the White House and turned over to investigators more than two years later, after the statute of limitations for a variety of civil lawsuits that could be brought against the Clintons had expired. Ultimately, the Clintons avoided charges or other sanctions, while both MacDougals and 13 other people, including a former Bill Clinton aide and his successor as Governor of Arkansas, were convicted of Whitewater-related crimes. Over a 10-month period in 1978 and ’79, Hillary Clinton made nearly $100,000 from an initial investment of $1,000 trading in cattle futures. At the time, a market veteran from the firm employed by Hillary to make the trade was quoted saying that Hillary’s account of how she had full control over the succession of relatively small trading decisions and did not receive favoritism was implausible due to the way the business operated. Throughout the 1990s, the Clinton family faced accusations that President Bill Clinton had sexually inappropriate behavior with a string of women, allegedly including at least Connie Hamzy, Gennifer Flowers, Paula Jones, Juanita Broaddrick, Kathleen Wiley, and Monica Lewinsky. In September 1999, the Clintons purchased a $1.7 million house in New York State, allowing Hillary Clinton to run for U.S. Senate in the state. During the race, her opponents accused her of “carpet-bagging,” since she had never resided in New York, nor had she ever participated in the state’s politics. Hillary Clinton spent a total of $29 million on her 2000 race, in what was then “the most expensive Senate contest in the nation’s history.” In November 2000, she won election to the office by 55 percent to 43 percent over then-U.S. Rep. Rick Lazio (R-N.Y.). After Democrats took control of the U.S. Senate following the 2006 midterm elections (during which Clinton was reelected), Hillary Clinton voted for the Lieberman-Warner Climate Security Act, “the strongest global warming bill ever to make it to the Senate floor.” The bill included a cap-and-trade system that would have raised $6.7 trillion over 40 years by auctioning permits and would have cost typical Americans $3,100 per household. She also voted against the Securing America’s Future Energy (SAFE) Act of 2001, which provided $15 billion for tax subsidies for fuel production and conservation, and against the 2004 Energy Omnibus bill, which allowed tax breaks for energy production. In 2001, she strongly supported U.S. military action in Afghanistan and voted in favor of the October 2002 Authorization for the Use of Military Force against Iraq. From the outset of her 2008 campaign, according to reports, Clinton ran as though she were the obvious choice. Even before her first event in Iowa, observers speculated that her focus seemed to be on the general election. The campaign was not prepared for a lengthy fight; it had an insufficient delegate operation; it squandered vast sums of money; and the candidate herself evinced a paralyzing schizophrenia—one day a shots-’n’-beers brawler, the next a Hallmark Channel mom. Through it all, her staff feuded and bickered, while her husband distracted. Similarly, Hillary was caught in a mistruth about a harrowing incident in Bosnia where she detailed how she had to make a run for it on the tarmac at Tuzla Air Base to avoid sniper fire. Subsequently, CBS News released a video showing Hillary Clinton and her daughter Chelsea smiling and waving as they walked at a leisurely pace across the tarmac from a cargo plane. After the election of President Obama in 2008, Clinton was appointed U.S. Secretary of State. She would serve through Obama’s first term, departing in 2013. Clinton also takes credit as Secretary of State for putting into place international restrictions on Iran, which forced Iran to the negotiating table for the eventual Iran Nuclear deal. She also said that Iran should be able to enrich uranium. She subsequently would support the Iran Deal after leaving the Obama administration. On September 11, 2012, terrorists attacked an American diplomatic facility in Benghazi, Libya, killing U.S. Ambassador to Libya J. Christopher Stevens and three other Americans. “Members of Congress have accused Clinton of offering misleading comments about the nature of the attack and failing to protect the Americans,” according to a report. As details of the events emerged, critics raised questions about whether the Hillary Clinton-led State Department had provided adequate security at the outposts in strife-torn Benghazi and whether some high-level officials on the ground or in Washington told back-up security forces to “stand down” rather than offer support while U.S. personnel were still under fire. Multiple investigations subsequently ensued, and official government reports found that numerous embassy requests to bolster the security presence in Benghazi were either ignored or rejected by officials subordinate to then-Secretary Clinton in Washington. In the course of the Benghazi review, it was revealed that Clinton had used a private email server to conduct official business while running the State Department. In various interviews, Clinton has said, “I did not send classified material, and I did not receive any material that was marked or designated classified.” However, an FBI investigation found that 110 messages contained information that was classified at the time it was sent, including some top-secret information. Moreover, Hillary only subjectively turned over approximately 30,000 emails in the course of the FBI’s investigation and withheld over 30,000 emails that she deemed to be of personal nature. But later, “investigators uncovered ‘several thousand’ work-related emails that she had not handed over to the State Department, and three of those were classified at the time they were sent.” FBI Director James Comey noted that there were likely work-related emails still out there that FBI investigators were unable to find. However, many of those transparency promises ended up not being kept. For instance, in 2010, the State Department approved the purchase agreement for a Russian-owned company that was seeking to purchase a Canadian uranium mining company with mineral rights in the United States. It was later revealed that the Clinton Foundation had received $2.35 million worth of donations linked to the Russian company that it did not disclose. The Canadian company involved was founded by a Clinton Foundation board member and $100 million donor. Former President Bill Clinton’s speaking-fees arrangement also raised questions about financial conflicts of interest. Overall, Bill Clinton successfully sought State Department approval for 215 speeches while Hillary served as Secretary of State, earning $48 million for speeches given frequently to foreign governments and entities that had interests pending before Hillary Clinton’s agency. Hillary Rodham Clinton officially announced her second attempt at a candidacy for President in April 2015, but at the time, Politico reported that she had actually been running — in place — for the better part of two years. She entered the race as the prohibitive favorite for the Democratic nomination, but throughout the primary, she was dogged by email-scandal criticisms and the insurgent campaign of Sen. Bernie Sanders (I-Vermont). Clinton eventually won the Democratic Presidential nomination and faced off against Republican Presidential candidate Donald Trump. In the general election, Clinton won more votes overall, but lost the Electoral College to Trump. A 2016 campaign postmortem, again by The Atlantic, described the flaws that led to her loss — claiming that Clinton’s campaign was arrogant; alienated white non-college voters particularly in decisive Michigan, Pennsylvania, and Wisconsin; over-relied on elements of President Obama’s coalition that weren’t inspired by her candidacy; and focused more on social issues than on economic policies that might win the support of rural working-class voters. During her 2016 presidential primary campaign, Clinton was characterized as a mainstream liberal who has consistently pushed for policies that would significantly advance progressive causes. Clinton also wanted to raise the federal minimum wage to $12 and supported efforts to expand Obamacare and Medicaid, stating that “there are plenty of things that could be done to strengthen Obamacare and expand coverage.”  She also supported the “public option,” a government-run health-insurance proposal favored by the far-left. She called ending for the embargo of Communist-controlled Cuba, wanted to protect “illegal immigrants from deportation,”  and argued that illegal immigrants should be able to obtain drivers’ licenses. In September,2016, Clinton commented that “you could put half of Trump’s supporters into what I call the basket of deplorables,” going on to call them “racist, sexist, homophobic, xenophobic, Islamaphobic—you name it.” While some speculated that the comment was a strategic effort to split educated and less-educated Republican-leaning voters, it was widely publicized by the press and her opponent’s campaign and has been blamed for her ultimate defeat in Pennsylvania. Forbes has reported that the Clinton family has gained substantial personal wealth after Bill’s presidency concluded, with one estimate of the couple’s total earnings reaching $230 million. Forbes estimated their combined net worth in 2015 at $45 million.